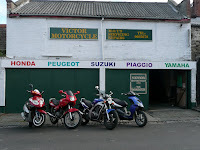 Victor Motorcycles was established over 50 years ago in Victor Road by Roy Kelly and then changed premises to our current location at 208 West Street when we became a limited company. We pride ourselves in being a family run business. That celebrated 50 years serving Bristol, in November 2009; which shows recommendation by our customers. Doug Kelly, the son, has been developing a loyal group of customers for the last 25 years, with his expertise and general knowledge; who enjoy the friendly and personal touch offered by coming to a dedicated reliable mot testing station, to keeping people on two wheels. You’ll find a warm welcome awaiting you time and time again. We know you’ll be a satisfied customer, who knows that their motorcycle is in safe hands whether a scooter or motorcycle. The equipped workshop caters for the full range of services including routine servicing, MoTs, accident repairs and tyre fitting/supply. If you have any requirements, and are not sure whether or not, we do something, just drop in or give us a call.